When Matt & I saw all the good things in Thomas Keller's Ad Hoc at Home we decided to cook our way through it. If you've ever looked at a Thomas Keller recipe you know they can be a little intense for the home cook (Lisa over at Left Coast Cowboys claims even his dressings have to be strained through a chinois sixteen times and involve the simultaneous efforts of five sous chefs) . This book is touted to be his "accessible" cookbook so we'll see how this pair of home cooks does. We started this week with Chicken Pot Pie. I stuck pretty close to the recipe except for a few things. It called for the carrots, potatoes & pearl onion to each be boiled separately with thyme, peppercorns & bay leaves. I understand this was to cook them each to their perfect tenderness but I couldn't be bothered & cooked them all together. The bechamel sauce was supposed to be strained through a cone-shaped fine mesh strainer before adding the thyme, parsley & cayenne. My bechamel was very smooth so I didn't bother with this step either (plus I don't own a cone-shaped fine mesh strainer). This is actually a twofer because I also made the Basic Pie Crust recipe from Ad Hoc. I have to say I'm pretty proud of how that crust turned out, beautiful & flaky. I did have to add a little more water than was called for but it is quite dry here right now. Matt said this was the best pot pie he'd ever had. The sauce was very thick creating a very solid pie, you could almost pick it up & eat it with your hands. It was extremely filling. I made half of the recipe & made two small pies. The recipe says this is 3 servings but really for us it was 4 . What I learned? That I can make a really good, flaky pie crust & to start the bechamel while you are cooking the vegetables or you'll be waiting for it to reduce at the end with a really hungry husband hovering around. Will we make it again? Definitely. 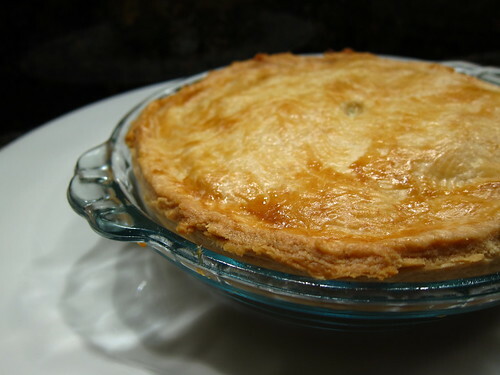 Oh you have me craving pot pie! This is beautiful! Beautiful! 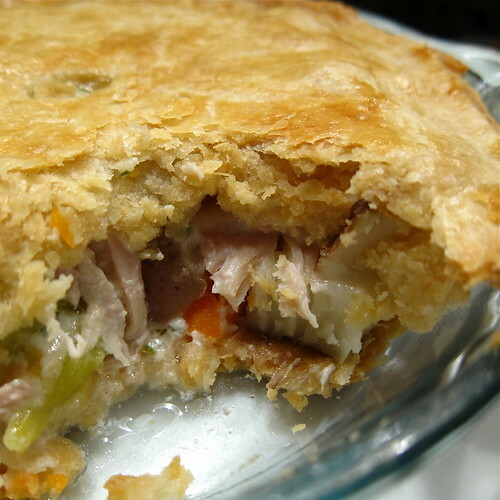 I have a real weakness for pot pie--especially chicken. The crust? Flaky and gorgeous! 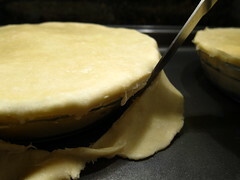 I love my pot pie recipe, but this crust looks amazing! Ad Hoc is on backorder EVERYWHERE. I have gone to every book store and even on amazon it is not in stock till Feb. 18, but I have it on order! It looks like a nice, simple book with food you can actually make everyday. I see Amazon is expecting it back in on Feb 2nd. I found it at B&N before Christmas. Its a beautiful book & really worth having. Aha! Cooking every vegetable separately. Straining the sauce. That's the Thomas Keller we know and love. Glad you omitted those steps and still had a winner. I know all about those Hungry Husbands hanging around. My husband got home from work and grabbed a slice of ham to pop in his mouth while he put away his stuff. Ugh! These pies look so good Kat. THe shots are perfect, I feel like I could reach right in and grab me some. this dish turned out great. i wanna stick my fork into the monitor to taste. maybe it's dangerous looking at foodie blogs with a fork close by. 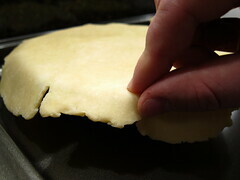 even more beautiful than the creamy, luscious innards is that flaky, decadent crust! 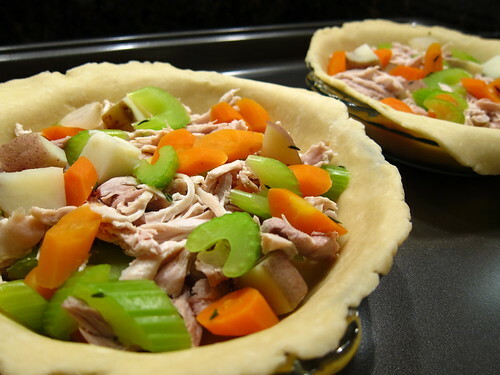 BRAVO to you--this looks like the perfect pot pie! 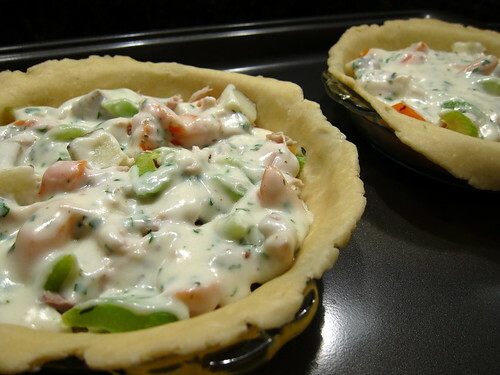 This chicken pot pie looks incredible! I'm looking forward to seeing more of your AHAH posts! Yay! We are close to freezing here in MN! What a great picture of a BEAUTIFUL crust!!! Seriously? There is a reason for each step. I can't take anyone seriously if they can't be "bothered" to perform a step in a recipe - especially if its Keller. First time here and love all the recipes and photos! That's a very smart looking chicken pot pie. As for bechamel, I always add warm/scalded milk to the roux and I never get lumps. No strainer required. YUM! I don't think I've made chicken pot pie before, but I do know I didn't expect not to see the chicken & veggies swimming in sauce/gravy. This idea of using bechamel instead is genius! Greetings! I need to pick up TKs book - we're still working off the first one. Definitely need to try this one after our next roast chicken (there's only two of us; one roast chicken would make about 4 meals, lol). Woah! This is the best looking pot pie I've ever seen. I love how thick it is. Oh my goodness. YUM! P.S. I love what you said about not having a cone-shaped strainer haha. I know you've been making lots of Ad Hoc recipes. You inspired me to look for the cookbook. Have you tried the crispy braised chicken thighs with olives and fennel? I made this weekend and I thought it was incredibly tasty. I feel his recipes are written for new cooks (or his editor didn't want to correct him). He had a full paragraph on how to cut fennel. Unnecessary. Cooking this right now! I'll have to come back and see what else you make, as I have the cookbook too and everything looks just divine.